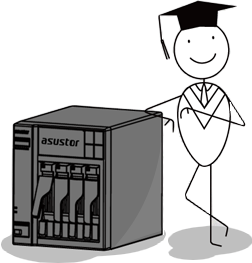 Installing ASUSTOR’s Mail Server can allow your ASUSTOR NAS to become Mail Server that supports SMTP, IMAP and POP3 protocols and is able to send and receive Email. 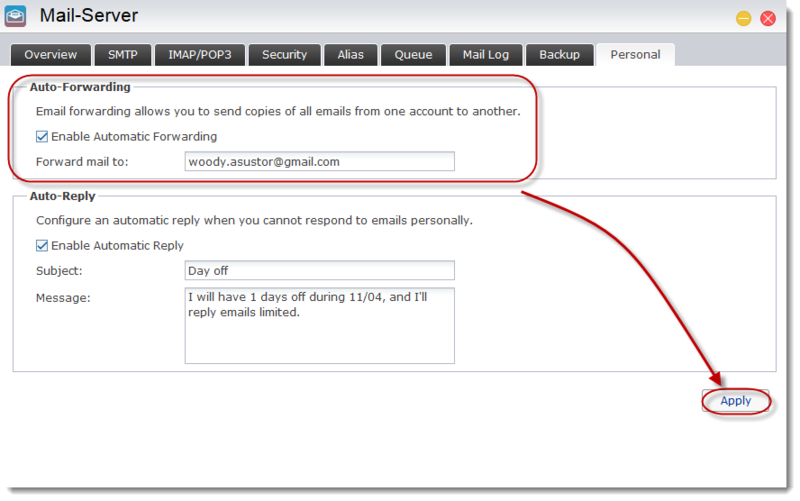 You can centralize management of accounts, backup emails, provide personalized settings such as automatic forwarding and automatic responses. 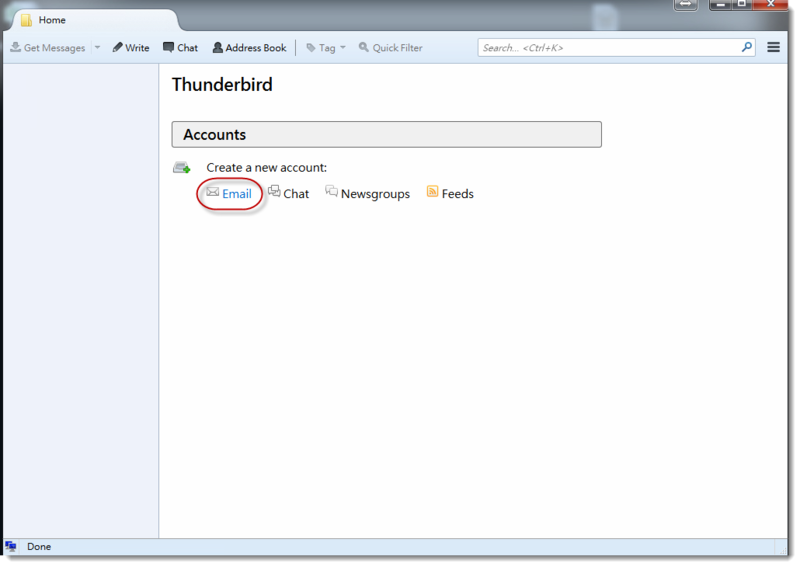 Additionally, you can also use software such as Thunderbird or Outlook to send, receive and manage your mail. 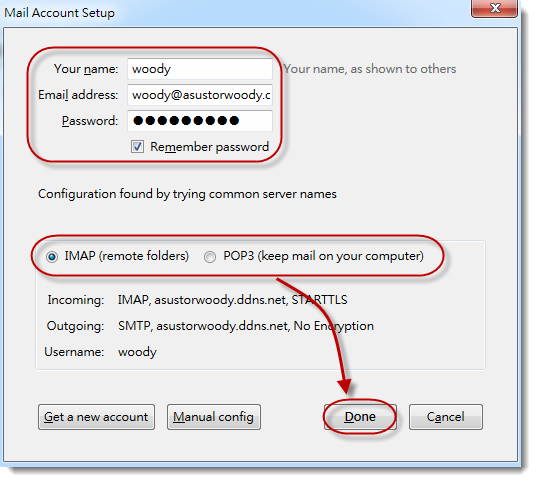 ü In the example below we sign up for a dedicated domain name with no-ip.com and then add a hostname (asustorwoody.ddns.net). ü Set the IP address as the NAS’s WAN IP (example: 36.226.187.21). 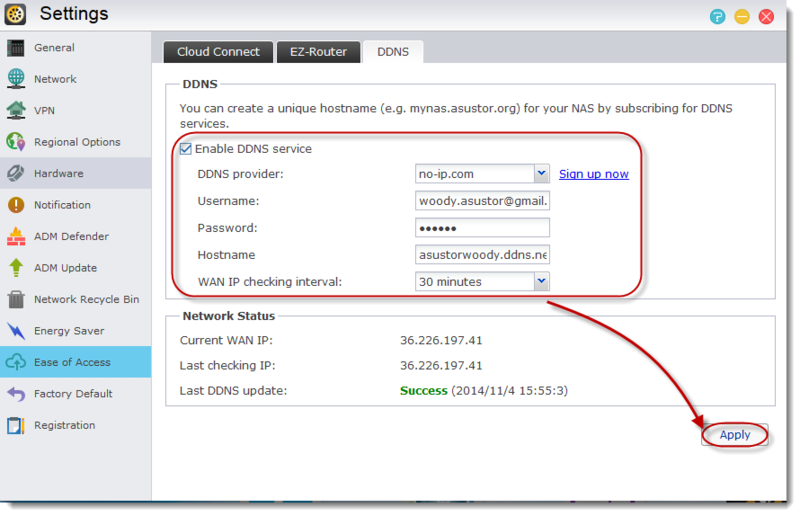 From the ADM desktop, you can select [Settings] > [Ease of Access] > [DDNS] > [Network Status] to find your NAS’s current WAN IP. 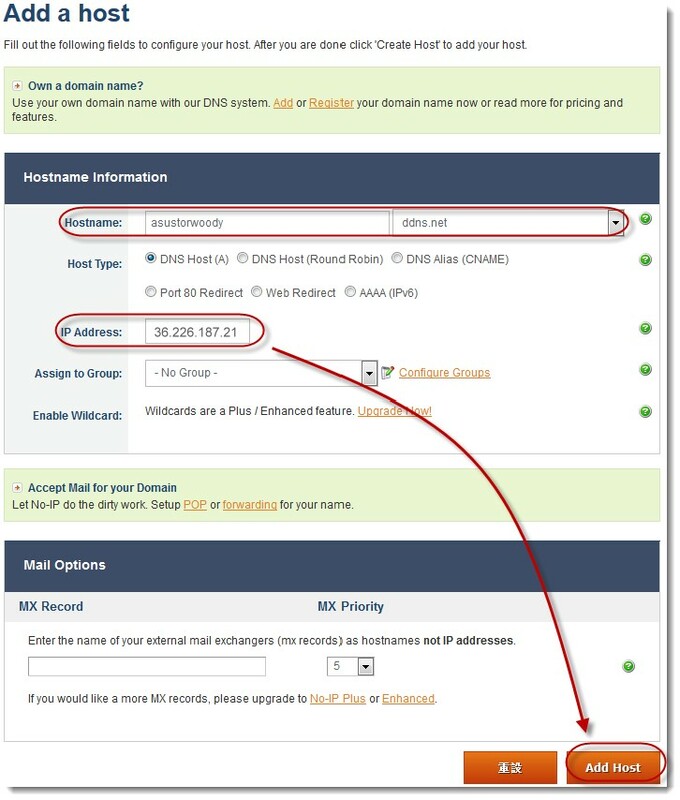 ü Enter the domain name that you have signed up for into the MX Record field as shown in the graphic below. After entering your domain name, click on [Update Host]. 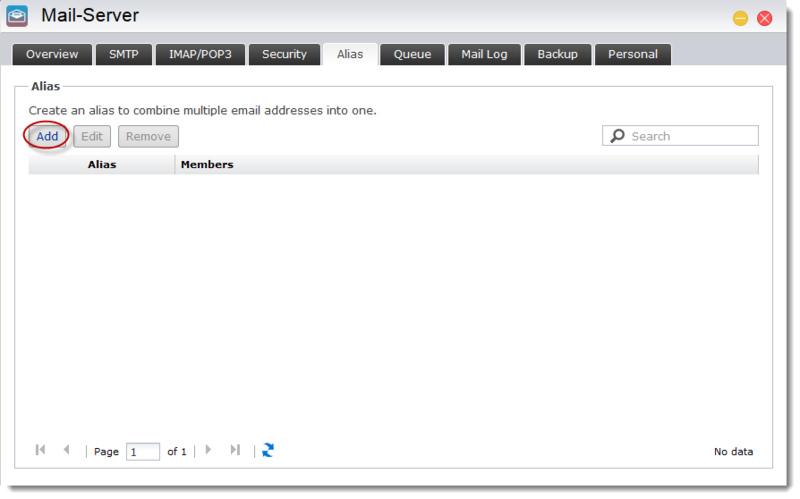 Note 1: You must sign up for a domain name or be using DDNS service in order for Mail Server to send and receive email. 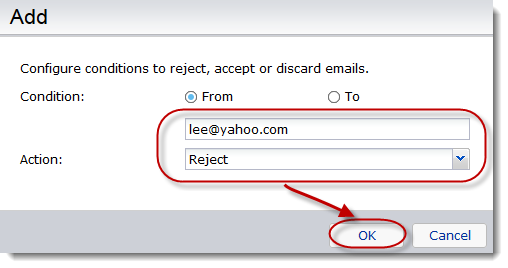 Note 2: You must create an MX record (mail exchanger record) in your domain name in order for Mail Server to send and receive email. ü Log in to ADM and select [Settings] from the desktop. ü Select [Ease of Access] > [DDNS]. ü Log in to ADM and open [App Central]. 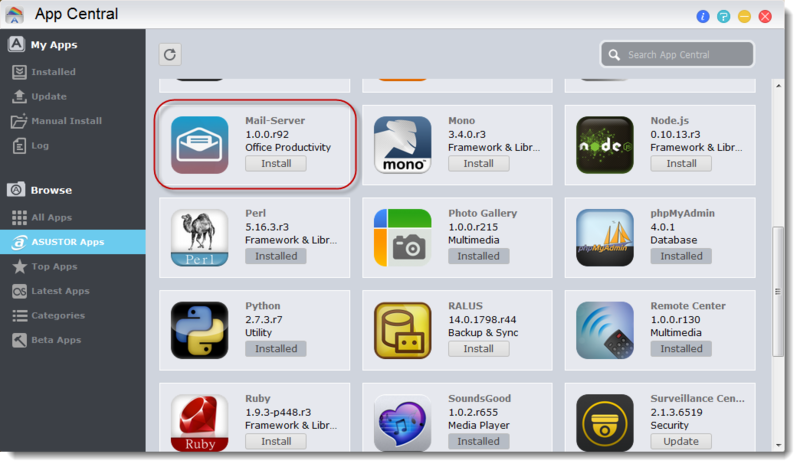 ü Select [ASUSTOR Apps] > [Mail Server] and then click on the install button. ü Select [Settings] > [Ease of Access] > [EZ-Router] > [Port Forwarding] > [Add]. 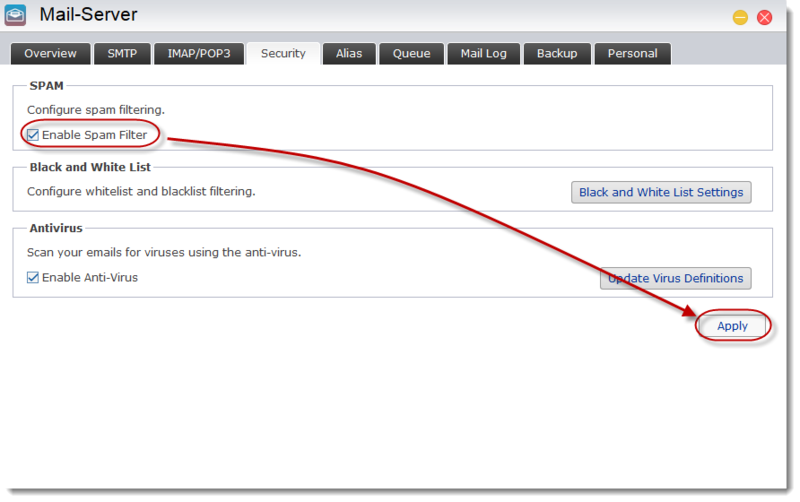 ü Set up port forwarding for the services indicated in the graphic below and then click on [OK]. 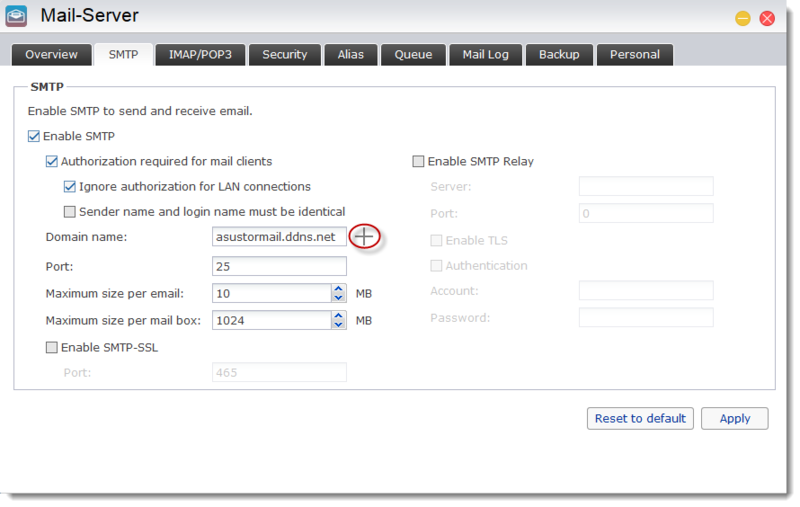 ü Select the [SMTP] tab and then select the [Enable SMTP] checkbox. 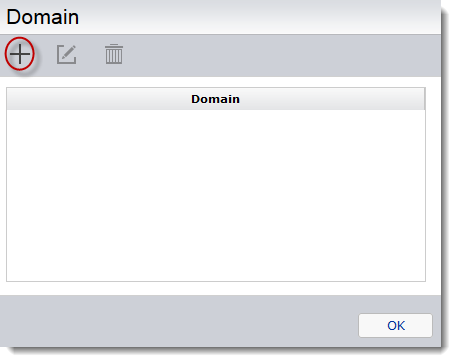 ü Enter your domain name (asustormail.ddns.net in our example) and then click on [Apply]. Note 4: The maximum size of a single email item is 50MB. Note 5: The maximum capacity of a single email account is 100GB. ü Click on the [ ＋ ] button as shown in the graphic below. ü The [Domain] window should now appear. Click on the [ ＋ ] button. ü Enter your domain name and then click [OK]. 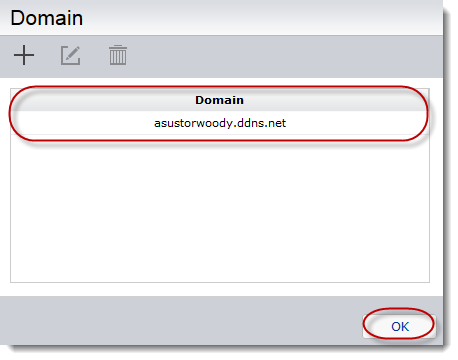 In our example we enter asustorwoody.ddns.net. ü You can now see your newly added domain name in the [Domain] window. 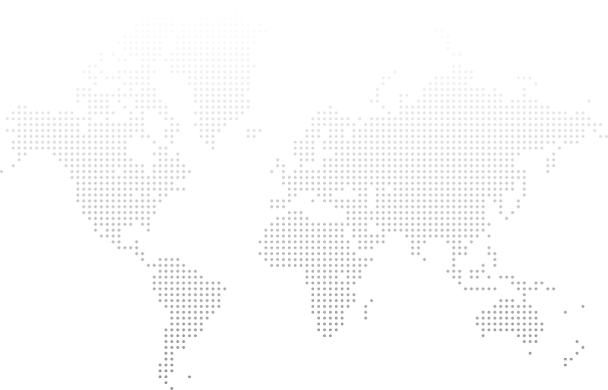 Most Internet service providers will block or return email sent from unknown domains. 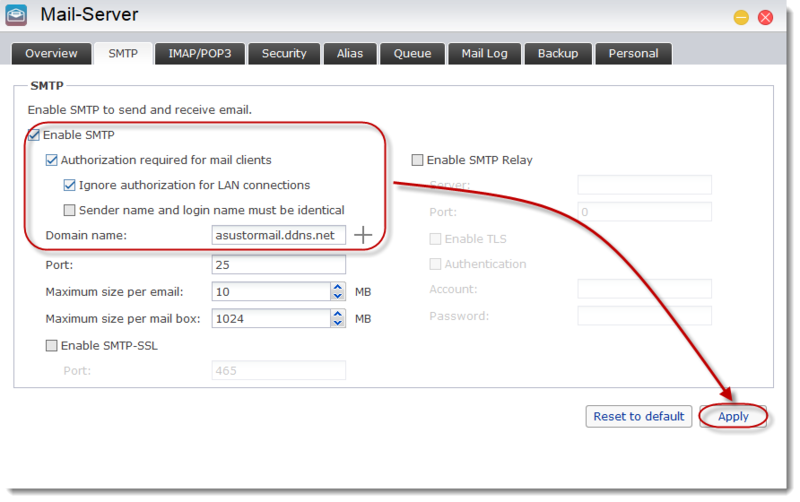 If you cannot send email from your domain, you must send email via other SMTP servers. 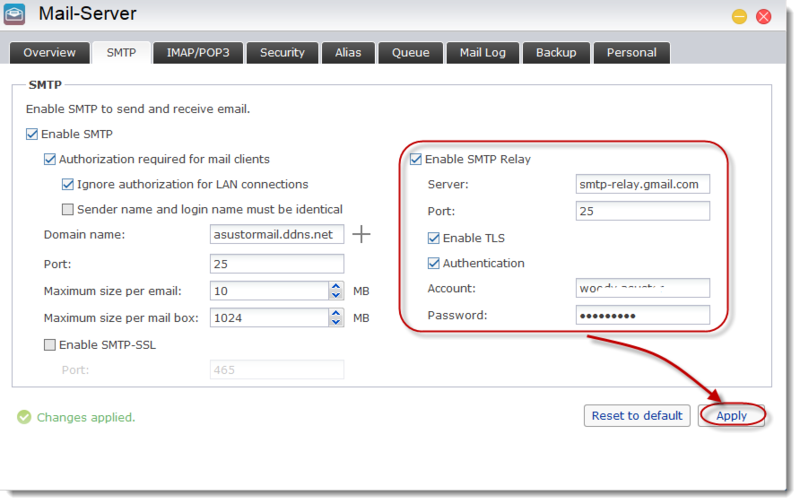 ü Select the [Enable SMTP Relay] checkbox and then fill in the required fields. ü Click on [Apply] once you are done. ü To enable the spam filter, select the [Security] tab and then select the [Enable Spam Filter] checkbox. Click on [Apply] once you are done. 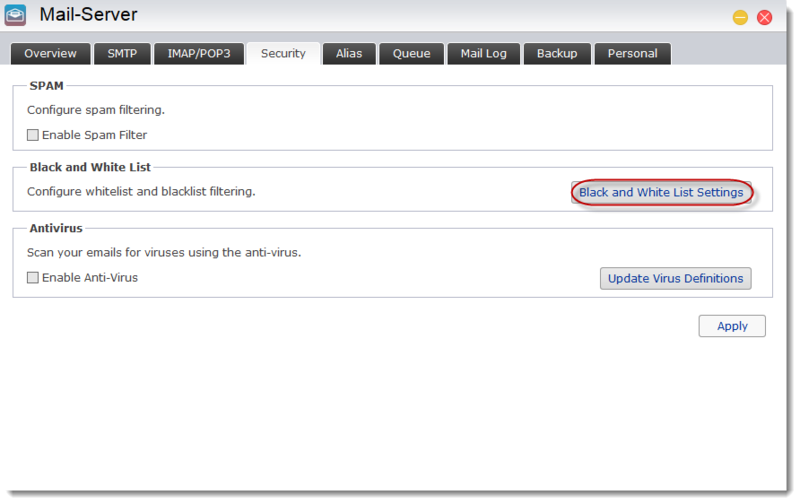 ü Under the [Security] tab, click on the [Black and White List Settings] button. ü Click on the [ ＋ ] button to add to the Black and White List. ü Configure a condition and an action and then click on [OK] once you are done. 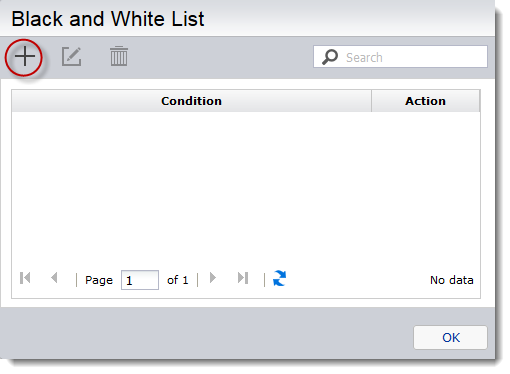 ü You will now be able to see your newly added condition and action in the Black and White List. 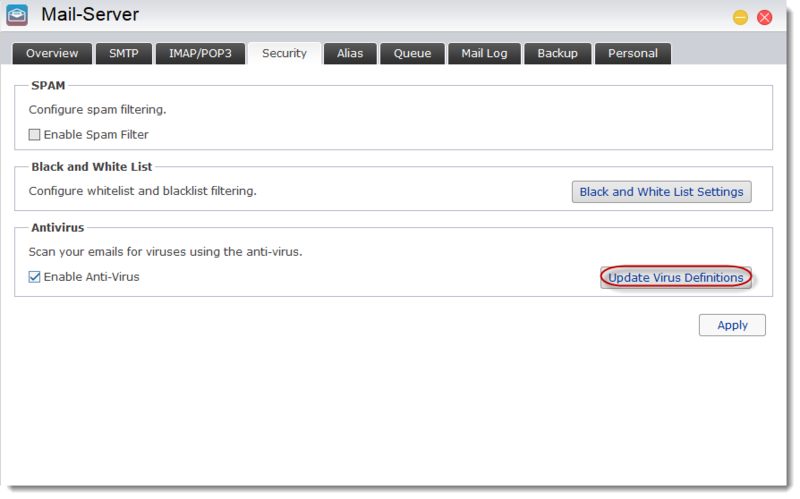 ü To enable the antivirus, select the [Enable Anti-Virus] checkbox and then click [Apply]. 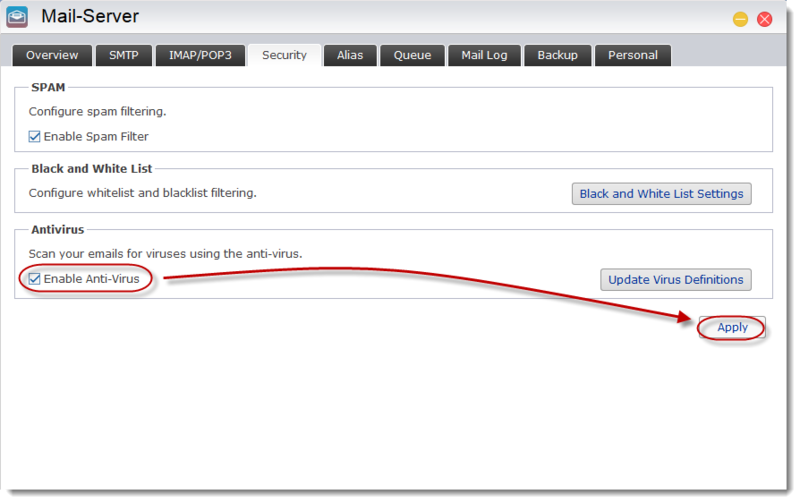 ü Click on the [Update Virus Definitions] button to ensure that your virus definitions are up to date. Note 6: If you wish to enable Antivirus, please make sure that the memory installed on your NAS is greater than 2GB. 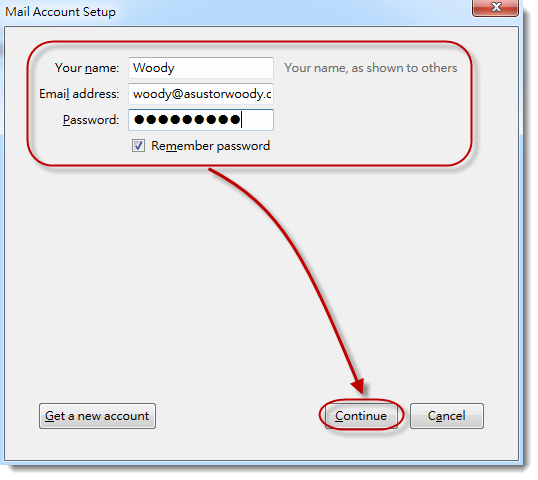 You can create an alias to combine multiple email addresses into one. 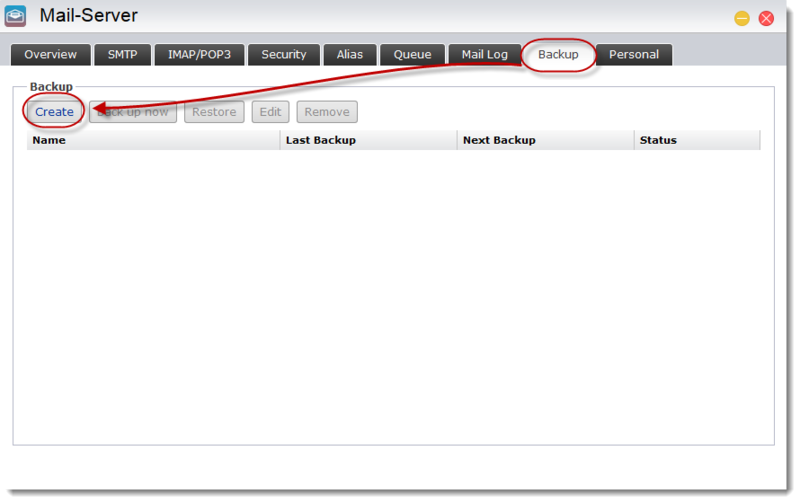 You can select the members of an alias from your ASUSTOR NAS’s users and groups. ü Under the [Alias] tab, click on the [Add] button. 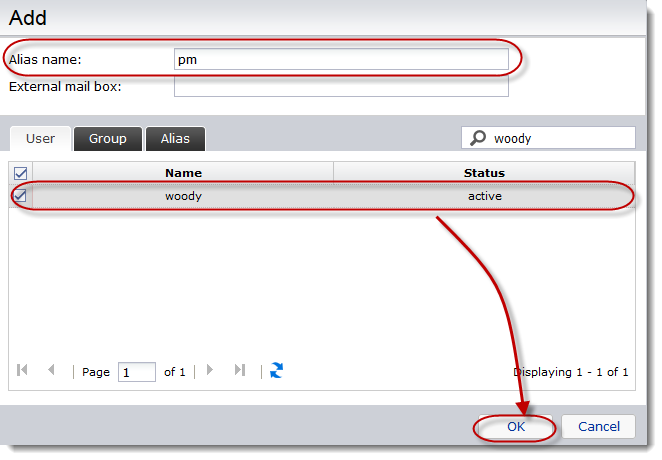 ü Enter an alias name and then select users or groups to add to the alias. Click on [OK] once you are done. Under the [Queue] tab, you will able to inspect all items in the mail queue. The date, sender, receiver, size and status of each item will be shown here. You can also search through and export (CSV file) the queue. 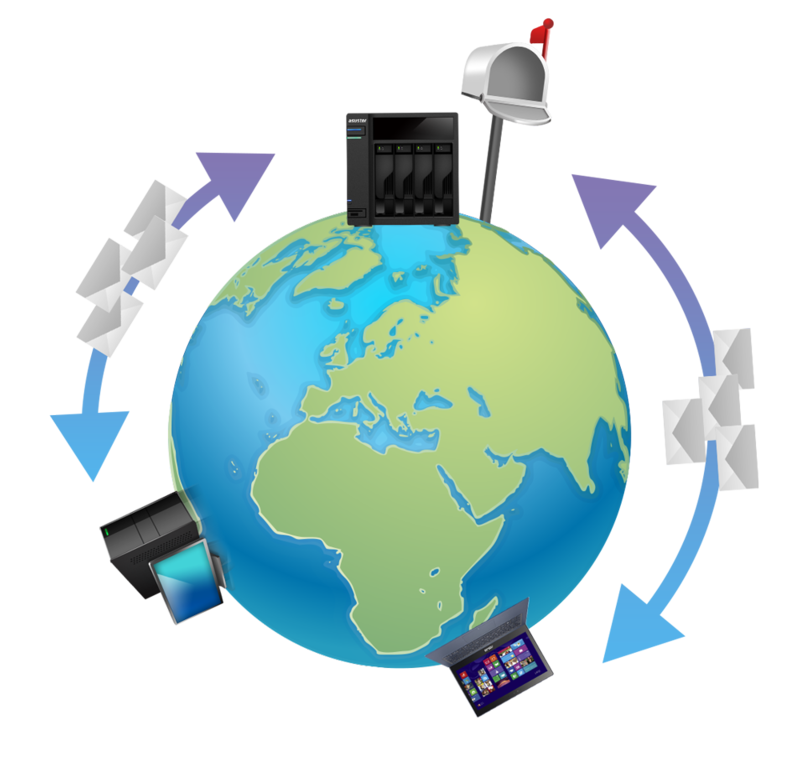 Under the [Mail Log] tab you will be able to find a complete record of all sent and received email including the time, sender, receiver, size and status of each item. 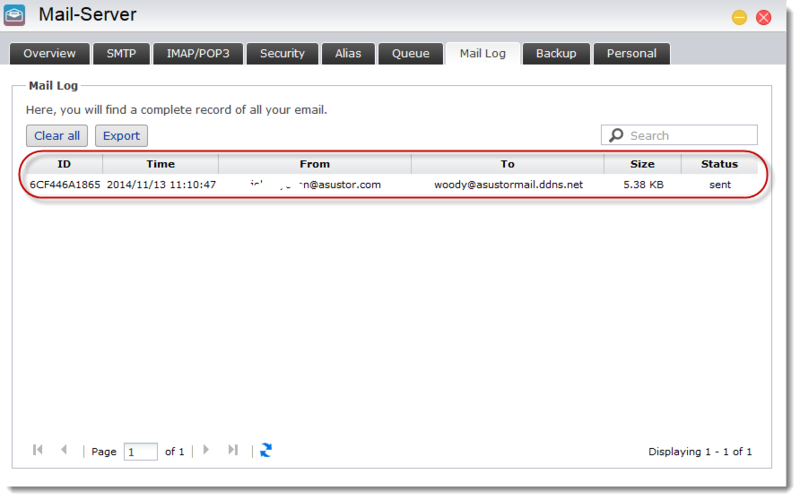 You can also search through and export (CSV file) the mail log. 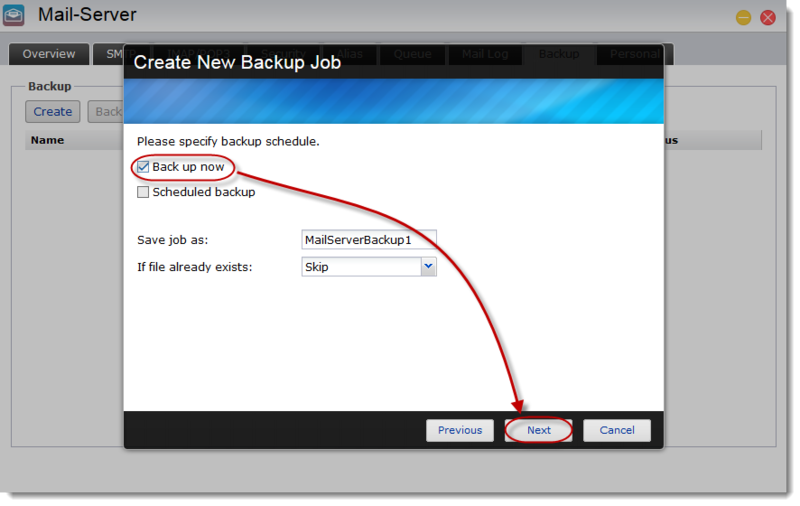 ü Under the [Backup] tab, click on the [Create] button to create a new backup job. 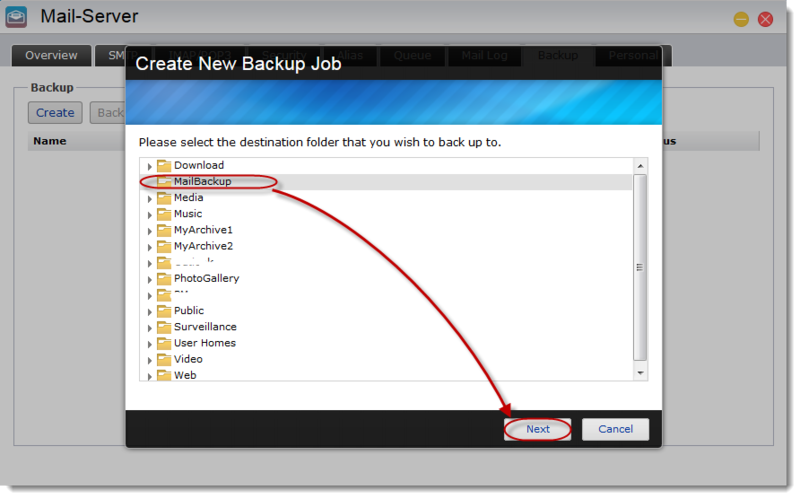 ü Select the destination folder that you wish to back up to and then click on [Next]. 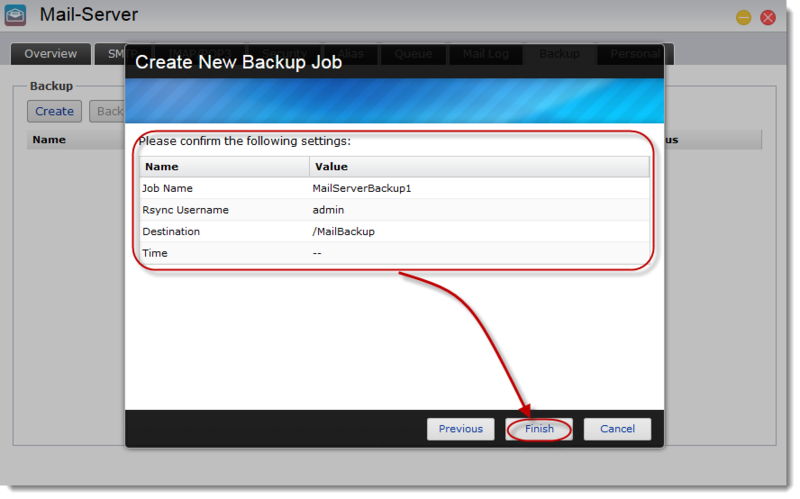 ü Select either the [Back up now] or [Scheduled backup] checkbox and then click on [Next]. ü Confirm the settings that you have configured and then click on [Finish] once you are done. 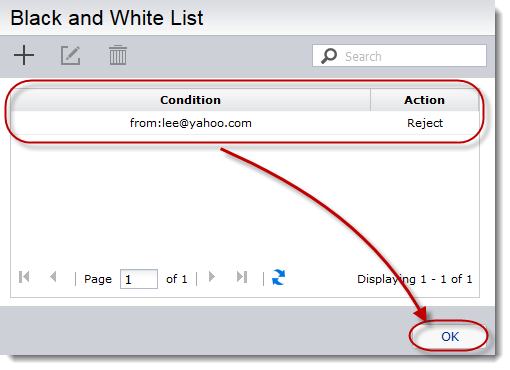 ü Under the [Personal] tab, select the [Enable Automatic Forwarding] checkbox, enter the email address that you want email forwarded to and then click on [Apply]. Under the [Personal] tab, select the [Enable Automatic Reply] checkbox, enter a subject and message and then click on [Apply]. 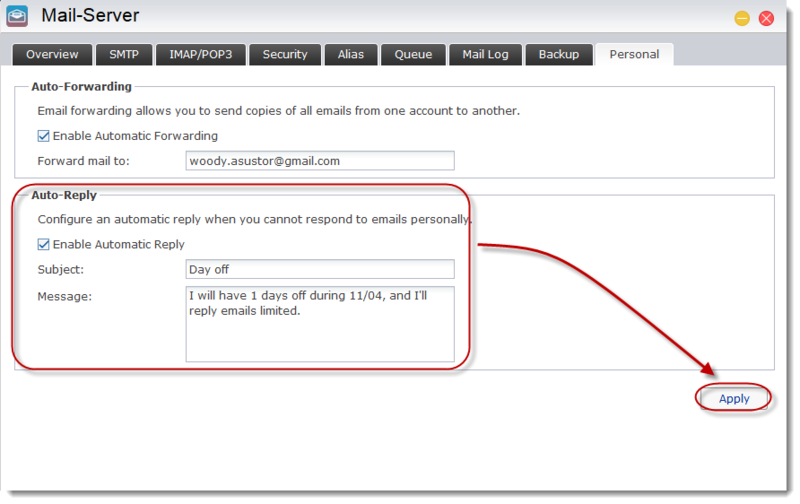 ü Click on the [Skip this and use my existing email] button. ü Fill out the fields for your name, email address and password and then click on [Continue]. 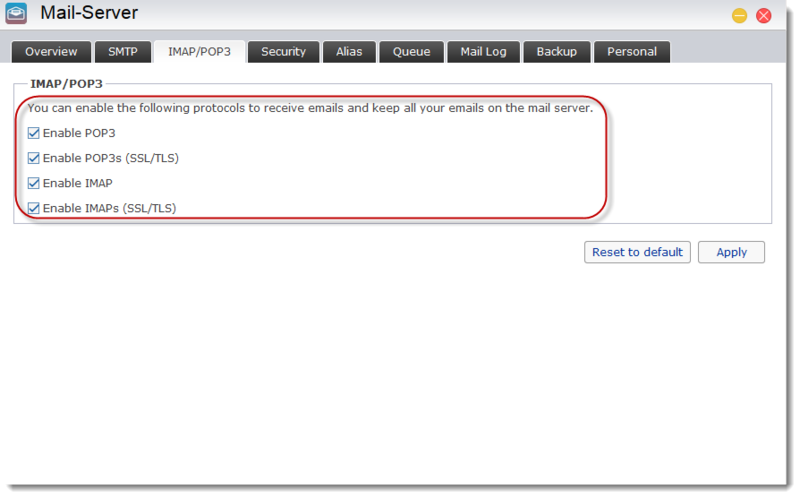 ü Select either [IMAP] or [POP3] to connect to Mail Server on your ASUSTOR NAS and then click on [Done]. 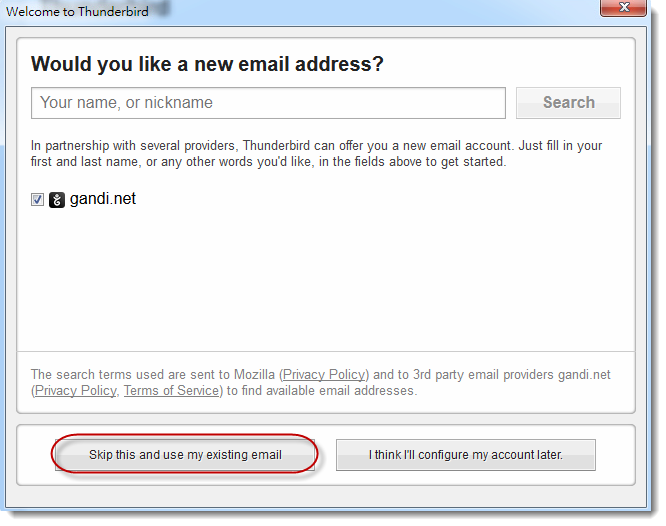 ü You can now use Thunderbird to send and receive email.